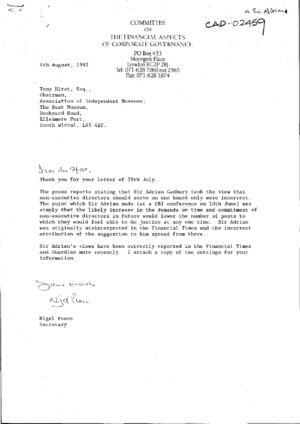 Cambridge Judge Business School : The Cadbury Archive : Correspondence, dated July / August 1992 between Sir Adrian Cadbury and Tony Hirst, Association of Independent Museums. Correspondence, dated July / August 1992 between Sir Adrian Cadbury and Tony Hirst, Association of Independent Museums. Hirst expresses concern about the suggestion that non-executive directors should only serve on one board.